Got Movers? Don't Make a Move Without Us! All American Movers is registered with TxDot, USDot, & FMCSA and are also proud members of the Southwest Movers Association. Additionally, the company has an A+ rating with the BBB! The crew is professional, experienced, uniformed & supervised. AAMS is fully bonded and insured for your protection and peace of mind. 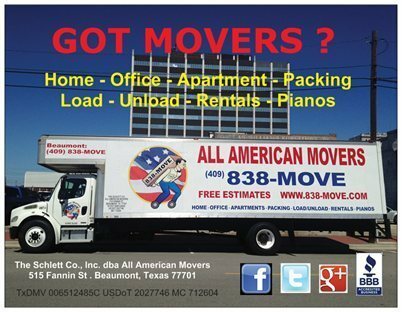 All American Moving & Storage Company is a Local Full Service Moving & Storage Company that traces it's roots to 1957 when Founder James W. Schlett started City Baggage & Transfer Co. in Beaumont. Wes, known as "Goin' Wes" because of his energy & work ethic, helped serve the moving needs of Southeast Texas for over 50 years. The Company has grown over the years, adding a 30,000 sq ft Safe, Secure Storage facility in the Heart of Downtown Beaumont located inside the Dallas Williams Building on Fannin St. ​ The Company changed names from City Baggage to All American Movers in 2001 around the time of the acquisition of the Storage Business and the terrible tragedy of 9/11. We did this as a way to show our patriotism and support for our country. We also updated our company logo by adding the American Flag waving behind the iconic image of "Goin' Wes" which we have never changed. ﻿ The Family Business is now in it's second generation with the addition of Rocky Schlett, one of the owner's sons. One of the cornerstones of our success is the hands on (no pun intended) approach taken to handling every move. This tradition is being continued by Rocky, with over 25 years experience in the moving business. Rocky personally manages, directs and supervises every move.